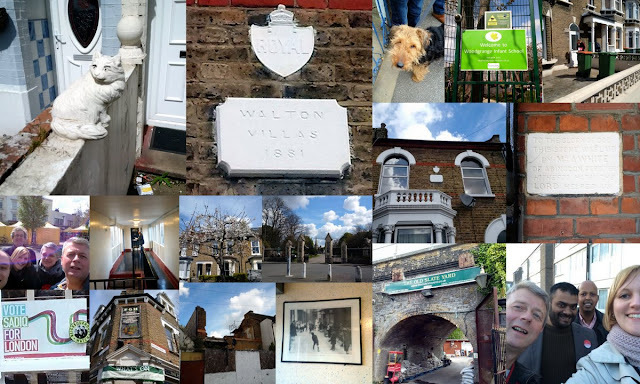 John's Labour blog: "On the Knocker" for Sadiq in Forest Gate. The collage is from recent campaign sessions in Forest Gate North (West Ham CLP). The Labour vote for Sadiq Khan in the ward is pretty overwhelming. It is also amazing how many Party members there are nowadays. Every street it seems has 2 or 3 members. I noticed what appears to be a Fire Insurance plaque on a building in Sebert Road, E7 (top middle). Not sure it is original since the London Fire Brigade was in operation by 1881. The statue of the cat on the garden wall (top left) is great. In a council owned block off off Forest Lane E7 there is a black and white picture (bottom middle) in the communal hallway of children playing cricket in the street. I wonder who put this there and why.